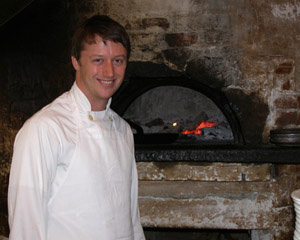 The elegant fine dining restaurant, allium restaurant + bar in Great Barrington, Massachusetts, in The Berkshires, features farm to table, seasonal, American cuisine by Chef Michael Pancheri, that if the food was any fresher, it would need to be cooked in the fields. The ambience is warm and welcoming in the intimate dining room with its wood floor, curved black wood chairs flanking tables dressed with white linens, chocolate napkins, and accessorized with white votive candles in glass holders, and illuminated by gold circle art sconces that cast patterned shadows on the white and sage green walls, and the wood beamed ceiling illuminated with fairy lights. 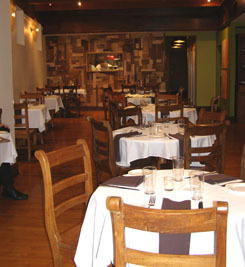 In the back of the restaurant, the wood wall has a large rectangular open space to watch Chef Michael Pancheri and his team in action. The large front windows of the dining room provide two cozy niches for dining and feature large starburst lights suspended over the tables. The bar at allium is divided from the dining room, and features a creative menu of specialty cocktails made with infused spirits, and is also set with tables for more casual dining. Edward and I had a wonderful dinner at allium restaurant + bar in early November 2009, where there had been a light dusting of snow on the ground in the morning and a slight chill in the air remained in the evening that hinted that cooler temperatures were on the way. With that in mind, Chef Michael Pancheri created a menu that matched the season and featured the bounty of the harvest from the nearby farms. We began our evening with an aperitif of Cava Brut Reserva, Avinyo Pendo, Spain, and enjoyed it so much that we decided to stay with it throughout dinner. 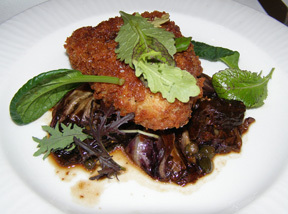 As his first course, Edward had Crispy Veal Sweetbreads with Grilled Radicchio, Black Mission Figs, and Capers, which was beautifully presented as golden brown sweetbreads on a bed of grilled radicchio, with figs, capers, and mesclun garnishes. This course was a delightful mélange of sweet and savory, with the flavors melding together beautifully. 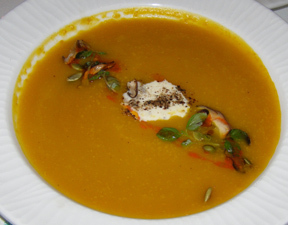 To take the chill off the evening, for my first course I had a lovely Squash Soup that was rich in taste and attractively presented with a garnish of goat cheese in the center and a sprinkling of pepitas and baby herbs. 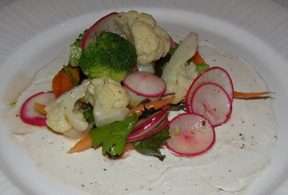 allium has a strong relationship with the nearby farms and supports local products, and we continued by splitting the Tasting of Early Fall Vegetables with Rawson Brook Goat Cheese and Petite Herbs which was a mixture of broccoli, cauliflower, thinly sliced radishes, cucumbers, baby carrots, white turnips, and baby herbs placed on a bed of goat cheese vinaigrette that delivered what it promised, namely fresh farm to table taste. Edward continued with Wood-Grilled Berkshire Pork with Great Northern Beans, Laura's Kale, and Applesauce, which was another well-executed course of taste and style, where Chef Michael Pancheri worked his yin yang magic of utilizing sweet and savory elements with the slightly bitter kale balanced by the sweetness of the applesauce. 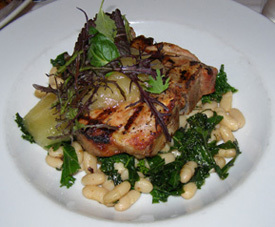 The perfectly cooked and golden brown pork chop was placed on a mixed bed of beans and kale, with a generous portion of applesauce, and was garnished with mesclun. A side of delectable Yukon Gold Hand Cut Fries with Homemade Ketchup, which were fries made for aficionados, rounded out this course. 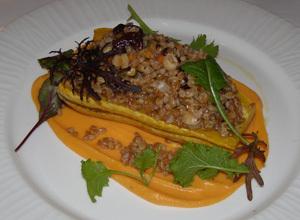 For my entrée I had Roasted Delicata Squash Stuffed with Farro Piccolo, Cherries, and Hazelnuts presented on a bed of squash purée. I always enjoy trying new things, and farro piccolo, a type of grain that was new to me, was a lovely introduction that worked well when combined with the squash, dried cherries, and chopped hazelnuts. What appealed to me beyond the artistry of color and flavors of this course, was the contrasting textures of smoothness and crunchiness that gave this recipe its power and balance. 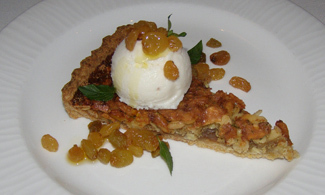 As a finale to Chef Michael Pancheri's savory and sweet vision, we split the dessert Pinenut and Rosemary Tart with Golden Raisins and Vanilla Ice Cream that was garnished with tiny mint leaves. Although the combination may sound a bit strange, once again Chef Michael Pancheri delivered a taste that intrigued and rewarded our taste buds with his signature sweet and savory style. allium restaurant + bar is open for dinner Sunday through Thursday from 5:00 pm until 9:30pm, and on Friday and Saturday from 5:00 pm until 10:00 pm. Read Chefs' Recipes where Chef Michael Pancheri provides his recipes for Chickpeas Crisped in Hot Oil; Mixed Green Salad with Candied Pecans and Lemon Thyme Vinaigrette; and Wood-Grilled Berkshire Pork with Great Northern Beans, Winterbor Kale and Honeycrisp Applesauce for a delicious taste of allium restaurant + bar.